Articles and thoughts from an italian Visual Studio ALM MVP. 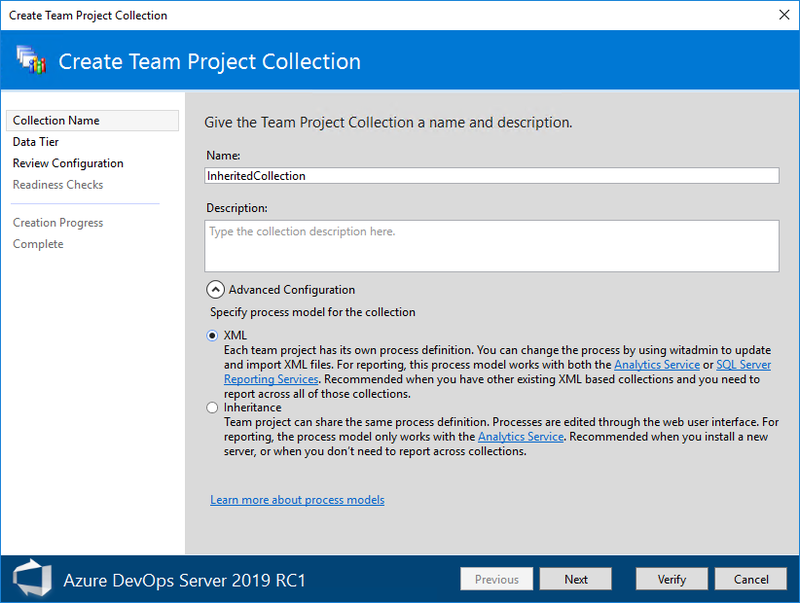 Another huge feature brought by Azure DevOps Server 2019 is Process Inheritance - meaning you are going to get the same customisation experience you get today on Azure DevOps Services on your own Azure DevOps Server instance. It is a collection-wide setting and it cannot be changed once the collection is created, so you won't get it for free when you upgrade to the new version of the product. But there are ways of moving stuff across, and if you do you will get all the benefits from the new model. Why am I so excited about it? Because as of now, the on-premise customisation was very powerful but also quite complex to master. The Process Template Editor in Visual Studio, witadmin.exe, storing the versioned changes somewhere else, all things that require time and effort, especially when you need to manage an instance that provide a service to your users. 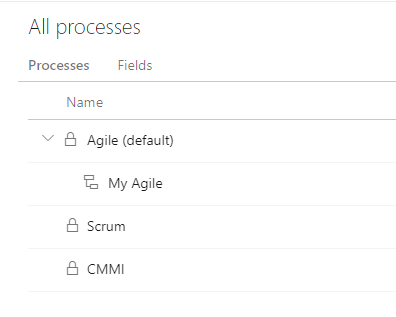 With the new process model customisations can be implemented straight from the Web UI, and finally the concept of process inheritance comes on-premise, making your life much easier. Once you start using this different approach you will be able to easily apply derived processes to your projects, without going through all the existing fiddling with witadmin or the Process Editor. It is a massive improvement. is this for 'new' collections created in 2019? or can i take an existing collection after upgrade to 2019, and shift it to this model? 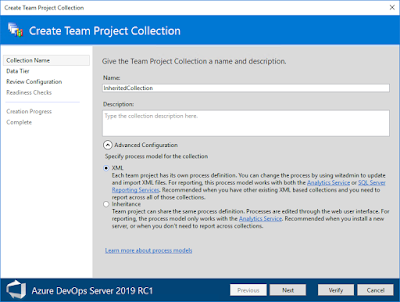 There are still people creating collections all the time :) M&As, reorganisations, optimisations - these are all scenarios where you can create new collections. But unfortunately you cannot move from one model to another - they are exclusive. You should propose a migration path for people using a collection with the XML process. This is really a show stopper for us, we won't create a new collection in our 660GB TFS instance only for that. Thanks for these sharing useful information. We are providing online training classes. Great Article !! Thanks for sharing..